The Malaria Host-Pathogen Interaction Center (MaHPIC) team will use the comprehensive research approach of systems biology to study and catalog in molecular detail how malaria parasites interact with their human and animal hosts. Pictured in the photo above are approximately half the Malaria Host-Pathogen Interaction Center (MaHPIC) team members, along with the Scientific Consultation Group (overseas advisors) and scientific guests. The National Institute of Allergy and Infectious Diseases, part of the National Institutes of Health, has awarded a five-year contract up to $19.4 million, depending on contract options exercised, to establish the Malaria Host-Pathogen Interaction Center (MaHPIC). The consortium includes researchers at Emory University, with partners at the University of Georgia (UGA), the Georgia Institute of Technology (Georgia Tech) and the Centers for Disease Control and Prevention (CDC). The Yerkes National Primate Research Center of Emory University will administer the contract. The MaHPIC team will use the comprehensive research approach of systems biology to study and catalog in molecular detail how malaria parasites interact with their human and animal hosts. This knowledge will be fundamental to developing and evaluating new diagnostic tools, antimalarial drugs and vaccines for different types of malaria. The project will integrate data generated by malaria research, functional genomics, proteomics, lipidomics and metabolomics cores via informatics and computational modeling cores. MaHPIC combines Emory investigators’ interdisciplinary experience in malaria research, metabolomics, lipidomics and human and non-human primate immunology and pathogenesis with UGA’s expertise in pathogen bioinformatics and large database systems, and Georgia Tech’s experience in mathematical modeling and systems biology. The CDC will provide support in proteomics and malaria research, including nonhuman primate and vector/mosquito infections. The principal investigator is Mary Galinski, professor of medicine, infectious diseases and global health at Emory University School of Medicine and director of Emory’s International Center for Malaria Research, Education & Development (ICMRED). She has been leading malaria research projects at the Emory Vaccine Center and Yerkes for 15 years. "We are thankful to the National Institute of Allergy and Infectious Diseases for recognizing the enormous potential of taking a systems biology approach to studying malaria infections," Galinski says. "This project will help us better understand malaria as a disease in depth and pave the way for new preventive and therapeutic measures. We expect to provide a groundbreaking wealth of information that will address current challenges in fighting malaria. The Georgia team we have assembled is outstanding and we also look forward to working closely with prominent international partners from malaria endemic countries." A prestigious international Scientific Consultation Group is also involved, and met with the MaHPIC team at Emory recently, following the annual American Society of Tropical Medicine and Hygiene conference held in Atlanta. The MaHPIC project involves studying both nonhuman primate infections and clinical samples from humans around the world. For the study of malaria, "systems biology" means first collecting comprehensive data on how a Plasmodium parasite infection produces changes in host and parasite genes, proteins, lipids, the immune response and metabolism. Computational researchers will then design mathematical models to simulate and analyze what’s happening during an infection and to find patterns that predict the course of the disease and its severity. Together, the insights will help guide the development of new interventions. Co-infections and morbidities will also come into play, as well as different cultural and environmental backgrounds of the communities involved. The team will use metabolomics techniques that will allow scientists to detect, analyze and make crucial associations with thousands of chemicals detectable in the blood via mass spectrometry. The techniques were developed at Emory by Dean Jones, professor and director of the Clinical Biomarkers Laboratory and MaHPIC’s metabolomics core leader. "This is a wonderful opportunity to integrate multiple types of rich biological data into dynamic models that will help scientists around the world devise novel strategies to help control not just malaria but other infectious diseases," says Greg Gibson, professor and director of the Center of Integrative Genomics at Georgia Tech. The Malaria Host-Pathogen Interaction Center (MaHPIC) consortium includes researchers at Emory University, with partners at the University of Georgia (UGA), the Georgia Institute of Technology (Georgia Tech) and the Centers for Disease Control and Prevention (CDC). The Yerkes National Primate Research Center of Emory University will administer the contract. "MaHPIC will generate experimental, clinical and molecular data associated with malaria infections in nonhuman primates on an unprecedented scale," says Jessica Kissinger, who will direct the project’s informatics team. Kissinger is professor of genetics at UGA and director of UGA’s Institute of Bioinformatics. "In addition to mining the massive quantities of integrated data for trends and patterns that may help us understand host and pathogen interaction biology, we may identify potential targets for early and species-specific diagnosis of malaria, which is critical for proper treatment," Kissinger says. The MaHPIC team will develop an informative public website and specialized web portal to share the project’s data and newly developed data analysis tools with the scientific community worldwide. "The sheer amount of detailed, high-quality information amassed by the experimental groups will be unprecedented. With this project we have an incredible opportunity to integrate data with modern computational tools of dynamic modeling," says Eberhard Voit, professor of biomedical engineering and cofounder of the Integrative BioSystems Institute at Georgia Tech. "This integration will allow us to analyze the complex networks of interactions between hosts and parasites in a manner never tried before. Systems biology will be the foundation for this integration." Malaria is endemic in about 100 countries including many developing countries in Africa, Asia, and along the tropics. It imposes a severe economic and human burden. Hundreds of millions are infected each year, and more than one million die, with the vast majority being children. Malaria in humans is caused by five species: Plasmodium falciparum, P. vivax, P. ovale, P. malariae, and P. knowlesi. The female Anopheles mosquito transmits malaria by biting an infected individual, allowing the blood-borne parasite to develop in the insect, and then passing the parasite on to someone else. Malaria parasites grow in the liver and then multiply in the blood, causing severe headaches, fever, chills, nausea, and sometimes, coma and death. Plasmodium vivax and P. ovale can lie dormant in the liver before restarting their multiplication cycle and causing illness in the blood. People living in areas permanently affected by malaria develop a partial immunity to the illness. In such individuals, infection leads to illness, but it is unlikely to prove fatal. Young children build this immunity over time through multiple infections and illness, while pregnant women can lose whatever immunity they had, leaving them vulnerable to the worst effects of the disease. No malaria vaccine is available, although some candidate vaccines have entered clinical trials. New drugs are needed because parasite drug resistance has been a huge problem. Resistance to artemisinin, currently a standard drug used in combination therapies, has been appearing in some countries. There is only one drug currently available for killing the dormant parasites in the liver. Also, there is a need for improved rapid diagnostic tests, to distinguish the different types of malaria and severity of the disease, as well as to potentially predict the presence of the dormant forms in the liver. MaHPIC scientists will examine infection in nonhuman primate models that are susceptible or refractory to a given parasite, or that display relapse or recrudescence (blood infections from the activation of dormant liver-stage parasites called hypnozoites, or a rise in a low level of parasites already present in the blood, respectively). Three nonhuman primate malaria species will be studied: P. coatneyi to model P. falciparum, P. cynomolgi to model P. vivax, and P. knowlesi, a monkey malaria species that has been causing illness and cases of death in humans in Southeast Asia. The MaHPIC project will also include New World owl monkeys (Aotus), which are susceptible to infection by the most predominant human malaria species, Plasmodium falciparum and P. vivax. At the same time, the center will collaborate with scientists in malaria endemic countries from around the world who are working in clinics and laboratories aiming to develop malaria vaccines, new therapies and diagnostics. In the context of larger ongoing studies in South America, Asia, Africa and the Pacific, MaHPIC will analyze blood samples to establish molecular signatures for different types of infections and disease states. Drs. 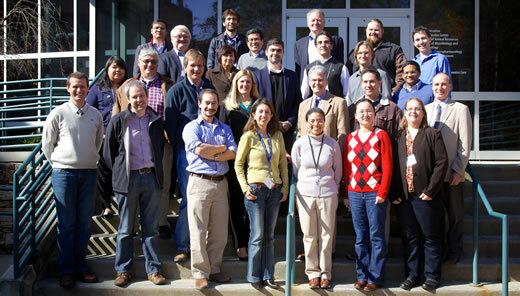 Galinski, Alberto Moreno, Esmeralda Meyer, and Juan Gutierrez are integrally involved with an NIAID-funded International Center of Excellence for Malaria Research (ICEMR) in Colombia, South America and an associated network of institutions supported by the National Institute of Allergy and Infectious Diseases, and several of these centers will have a role in the MaHPIC. Emory University will be awarded up to $19.4 million over a five-year period if all contract options are exercised, according to the contract signed with NIAID (NIAID Contract # HHSN272201200031C). This contract is in response to Emory’s application filed in June 2011 through a competitive NIH solicitation for proposals called "An Integrated Approach to Understanding Host-Pathogen Interactions", Reference# NIAID-DMID-NIHA12O1O1OO. Emory University, along with its partner institutions, is the only recipient of a contract under this NIH program request, with its application titled: Systems Biology of Malaria as a Model for Host-Pathogen Interactions. The award will support the current jobs of 23 employees among the Georgia institutions and create more than five new jobs, while also stimulating many new educational and research opportunities. "Bringing to bear so many new technologies on such a globally important problem that just hasn't seen this scale of work done before is a tremendous opportunity. Though the challenges in interpreting and understanding all of this data are significant, they are dwarfed by the possibilities of what could come of this work." Principal investigator Mary Galinski, is a professor of medicine, infectious diseases and global health at Emory University School of Medicine and director of Emory’s International Center for Malaria Research, Education & Development (ICMRED). She also holds faculty appointments with the Rollins School of Public Health and the Department of Microbiology and Immunology. 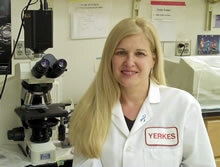 Galinski has been leading research programs at the Emory Vaccine Center and Yerkes National Primate Research Center for 15 years. She is the founder and president of Malaria Foundation International, and has been an advocate for malaria research, education and training since 1992. At Emory, Alberto Moreno, assistant professor of medicine (infectious diseases) will serve as co-principal investigator and Esmeralda Meyer, an assistant professor at Yerkes, will function as MaHPIC’s program manager. Moreno and Meyer have been instrumental in the development of malaria research projects at the EVC and Yerkes, ICMRED and MaHPIC. Moreno and Barnwell (CDC) will head MaHPIC’s malaria core. Other Emory co-investigators include Dean Jones, professor of medicine and director of Emory’s Clinical Biomarkers Laboratory, who will head MaHPIC’s metabolomics core. Sarah Pruett, Yerkes research associate and director of its biomarkers core, will head MaHPIC’s lipidomics core. Chris Ibegbu, assistant professor and director of the Emory Vaccine Center’s human immunology core, and Tracey Lamb, assistant professor of pediatrics, will co-direct MaHPIC’s immunomics core as director and deputy director, respectively. At UGA, Jessica Kissinger, professor of genetics and director of the Institute of Bioinformatics, will serve as a co-principal investigator of MaHPIC and lead the project’s informatics team. The MaHPIC project is an extension of Kissinger’s work with EuPathDB, an NIH-funded online database portal to multiple eukaryotic pathogens, including Plasmodium. Also at UGA, Juan Gutierrez, assistant professor of mathematics, will perform mathematical modeling and data management with the UGA informatics team. Gutierrez has been instrumental in the development of MaHPIC through his introduction to the Emory team via the NIAID-sponsored ICEMR led from Colombia, South America. At Georgia Tech, Greg Gibson, professor and director of the Center of Integrative Genomics, will be the director of the functional genomics core. Eberhard Voit, professor and David D. Flanagan Chair in biological systems, Georgia Research Alliance Eminent Scholar, and cofounder of the Integrative BioSystems Institute, will be the director of the computational modeling core. Mark Styczynski, an assistant professor in Chemical & Biomolecular Engineering, will serve as deputy director of the computational modeling core. The National Foundation for the Centers for Disease Control and Prevention (CDCF) will support the activities of two senior CDC investigators. John Barnwell, chief of the Malaria Laboratory Research and Development Unit in the Malaria Branch, will function as co-director of the malaria core with Alberto Moreno (Emory), and Jan Pohl, chief of the Biotechnology Core Facility, will head the proteomics core.